Saturday, Skip Palmer and I built a pair of work tables in the studio. Christian and Skip working on the first table top. One is mine, one Skip’s. The plans for the tables were provided by EAA-1000, and are standard 2’x5′ work tables. The materials are simple – 2×4’s and plywood. The construction process is simple, too. The results were very consistent and very sturdy. I’m planning to build a wedging table based on the same plans, but slightly shorter and only 3′ wide. We still plan to sand the table tops and treat them. I’m going to seal mine with a few coats of polyurethane to make cleanup easier. Also of interest, the lower shelf should provide good storage for 5 gallon buckets of dipping glaze. Building the second table on the first table - already working! The plans can be found online, and the materials for the 2 tables cost about $150, with enough plywood left over to build the wedging table. The instructions include fairly accurate instructions, and an excellent materials list and cut list for the 2×4’s. 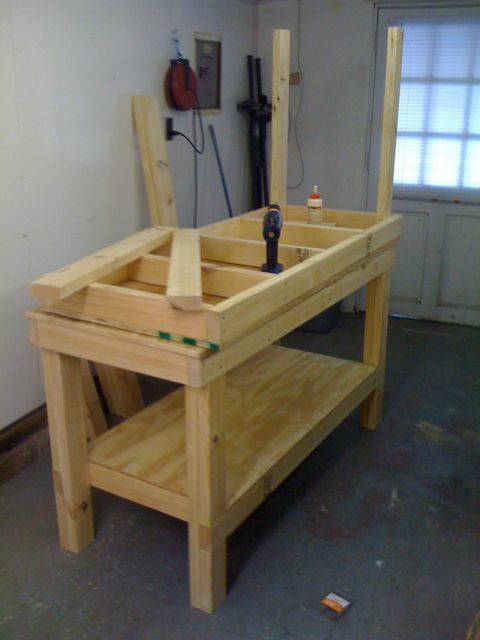 If the wedging table works out, I’ll post an adapted version of the instructions for it. This is really exciting for me, since the work table and wedging table are the last “big” pieces of equipment I need for the studio. Still need the kiln set up and plenty of work and materials to collect, but these are the last of the fixtures or furniture. I’m also plased that the table turned out so solid and sturdy. I couldn’t find anything comparable for twice the price. Barley Hollow Pottery is one step closer to seeing it’s first bit of pottery production.